When I first started to post the pictures in FB, some had actually mistaken it as a real salted egg yolk within ! That goes to show how convincing I had make out my mooncakes to be ! Hahaha !! An achievement unlocked yeah !! 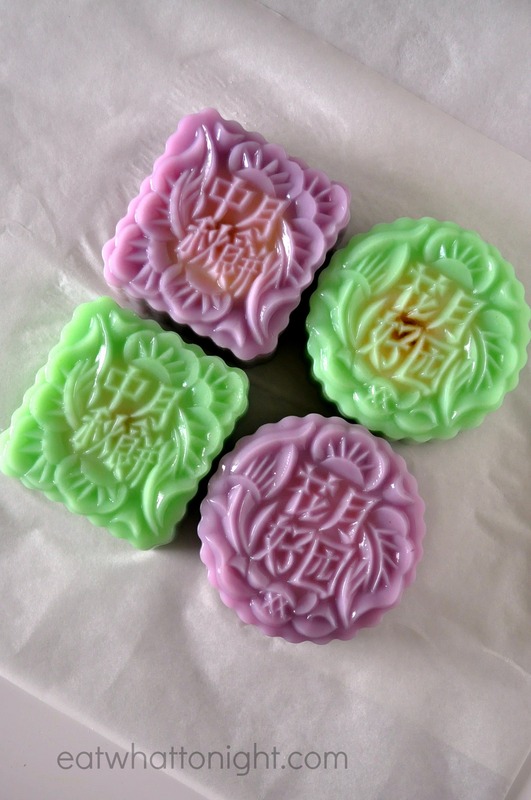 The entire mooncake is made of agar agar jelly, including the so-called “salted egg yolk”. And for the first time, I took pictures of the step-by-step method !! It’s indeed not easy, because you have to juggle between the pots and the camera and keeping your hands dry while taking pictures. So I am not sure whether the pictures are comprehensive enough though or if I had missed out certain pictures steps, do pardon me. I tried my best at least, with the mobile camera as that’s the fastest to capture the process shots whilst not missing out on the jelly making concurrently. Whilst many people has been asking for the methods, recipes, especially the making of the jelly “salted egg yolk”, I made this post a priority to be published as soon as I can so that everyone is in time to make them for the Mid-Autumn Festival ! 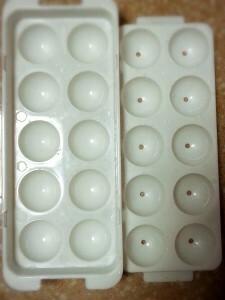 To make the jelly egg yolk, you need this mould which you can purchased from Sun Lik Trading at Seah Street. And I so happened to find that Daiso carry this too, at the section where all the ice-cubes trays are found. The making of the agar agar jelly is pretty much the same as in all other methods. So here I will elaborate on the making and placement of the “salted egg yolk” and the “filling” in the mooncake. Cook the agar agar jelly as usual (if you require, the recipe is below) till it boiled. Place the liquid into the mould till it’s filled to the brim. Place the cover over slowly till the liquid spills out from the little hole at the top and press it tight. Remember to place a tray beneath it to catch all the liquid that will overflow. That’s bound to be wastage for this, but no choice leh. To keep it tighten, you can place something heavy over the mould, and I used a glass container as you can see. You can see that the jelly is almost set when the spillage starts to solidify. Remove the cover slowly and remove the jelly balls from the mould. I used a muffin tray for the “filling” of the mooncake. Filled it up till 2/3 full and place a jelly egg yolk in the middle of the muffin hole. Umould when all are set. Now we have come to the skin of the mooncake. Pour the jelly mixture into moulds until about 1/3 full. 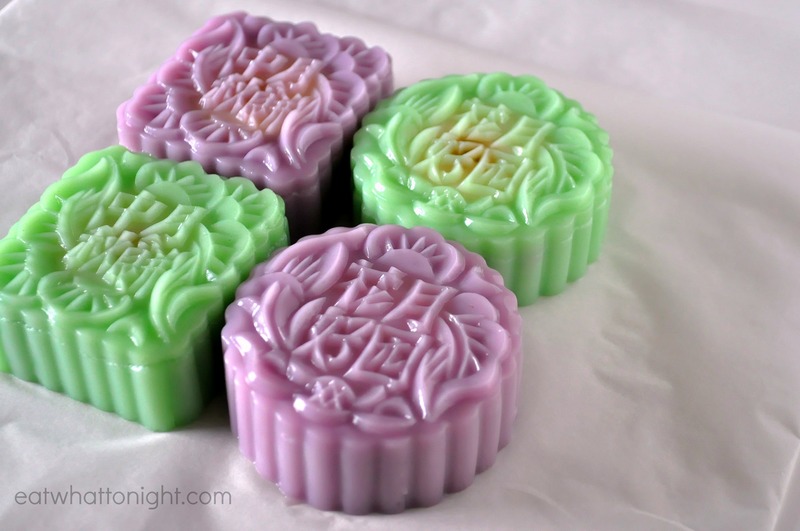 When it has half set, place the mooncake fillings into it and pour in the jelly mixture for the skin until they are full. 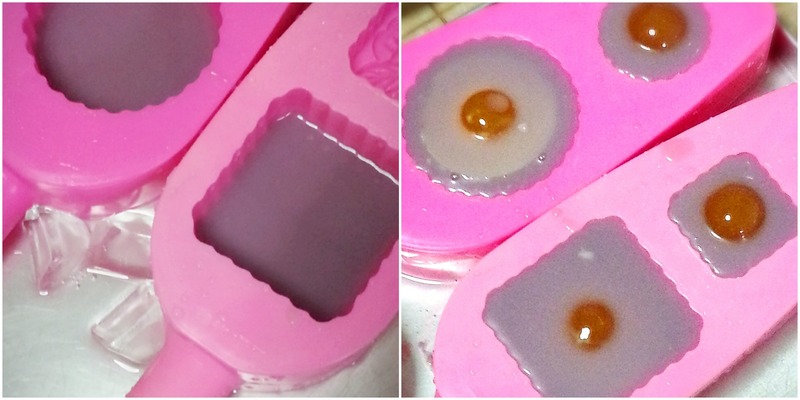 As you can see, I have placed ice cubes alongside the moulds to speed up the setting process as I have only 2 mooncakes moulds but my fillings are enough to make for 5-6. Therefore, I need it to be set fast before I can go one more round to make the next batch. When the mixture is cooled, chill them in the fridge until firm. Unmould and serve ! And these are your final products ! 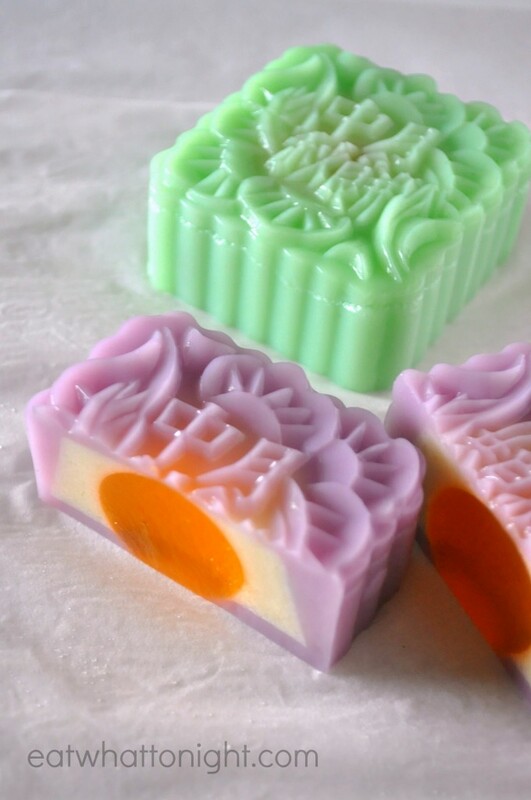 Agar Agar Jelly Mooncakes with "Salted Egg Yolk"
Boil all ingredients together until sugar dissolves and remove from heat. Stir in coloring and pour into jelly ball ice cube tray, press tight. Combine all ingredients and bring it to boil. Remove from heat and add in yellow coloring and mix well. Pour into muffins moulds as pictures above and leave to set before unmoulding. Boil all ingredients together until sugar dissolved and remove from heat. Stir in green/purple food coloring and mix well. 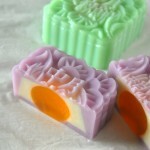 Pour mixture into mooncake moulds based on steps above. 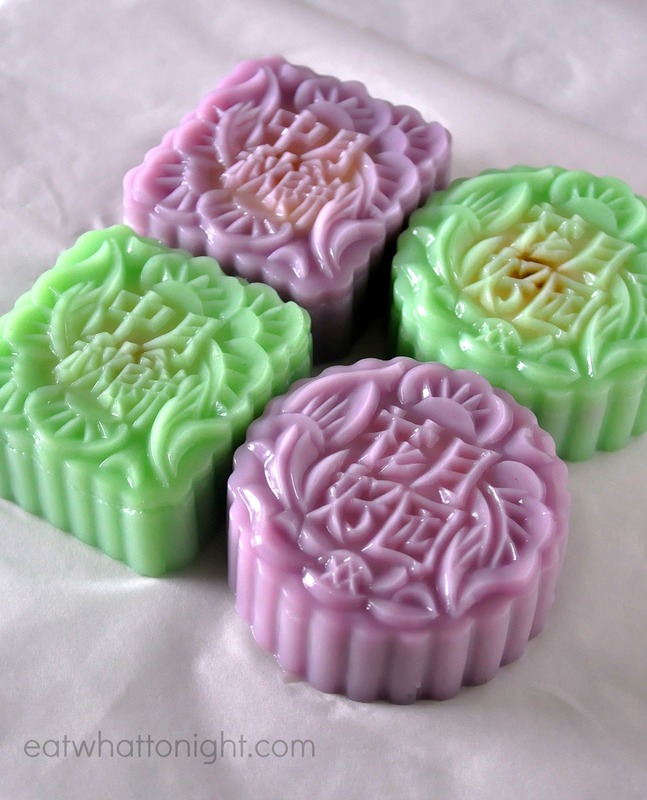 The recipe below is meant for an estimate of 5 complete pieces of agar agar jelly mooncakes, with some extra. You can free to change the amount of sugar and coconut milk to water proportions as you desired. The standard rule of thumb is 1 pack of agar agar powder (10g) is to be mixed with 1000ml of water. If you prefer it firmer, you could reduce the water by 100ml or reduce 1 teaspoon of powder from the 10g pack. How much coconut milk is to be used depends on individual’s preferences as well. You are free to replace it with fresh milk or soya bean or even if all are not preferred, just water will do also ! Where do u get the ice ball tray? May I ask what kind of agar agar powder did u use? I saw supermarket selling only swallow brand with different colors? May I know what type of purple color you use? I can’t get such a nice purple like you. I used the normal purple food coloring from Bake King in the small glass bottle commonly sold in the supermarkets. You can add the coloring drop by drop till you get the tone you want. No prob, Jeannie. Hope you get the agar color that you want ! I tried to make the egg yolk but it doesn’t solidify at all. Could it be in addition too much water cos I replaced orange juice with egg flavour so total water is 280ml. Should I maintain at 200ml? Hi lily, I had this problem previously also. Did u cook the mixture till it fully boiled when alot of bubbles formed ?? You need off the flame only when it fully boiled. The last time i was too anxious and took it off when it just started to boil only with some small bubbles… in the end it did not solidify as well. Abit of extra water should not have such a big impact though. maybe i took it off the fire too fast. so adding 280ml water is fine or should i reduce it a bit? It’s better to reduce the water also. Usually is 1000ml of water to 1 pack of agar poweder.. but I always reduce it to around 900ml as I don’t want it to be too soft which will be harder to handle too. Hi Joyce, thanks for sharing. Just wondering if I can use konnyaku jelly powder? Thanks! Hi Patricia, tried with konnyaku jelly before, but as the jelly is softer and more elastic, it will be more difficult to handle. 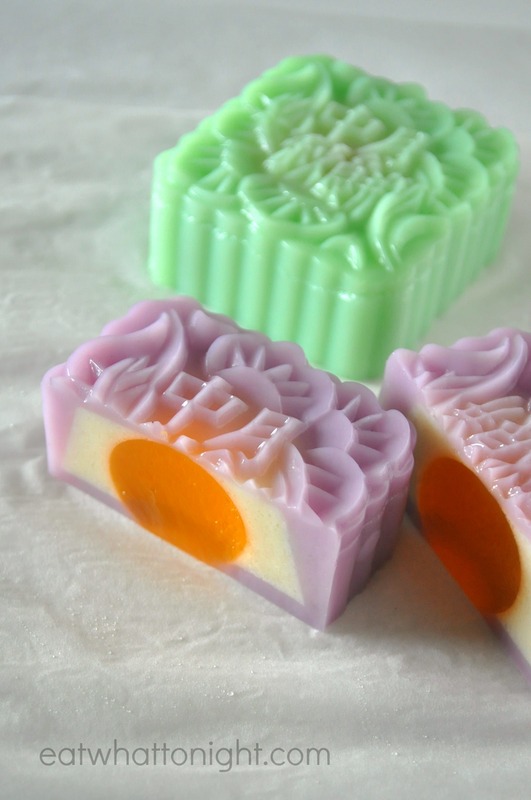 Hi, thanks for the jello mooncake step by step instructions. Glad to stumble into your blog. Hi, may i know how long can the agar agar last if refrigerated? Hi Doreen, if u have used fresh coconut milk in the making of it, it probably can last 1-2 days only. Great post and tried it out..turns out great!! However ,my Mooncake have a lot of bubbles..may I know how to remove those? Thanks! Hi Elsie, good to hear that !! You can run the mixture through a sieve when pouring the agar mixture into the mould..
Just checking if it’s correct. For the filling your recipe says 1/2 tablespoon agar (rather than teaspoon) but for the skin it says 4 teaspoons agar and egg yolk 1.25 teaspoons agar. Hi Karen.. sorry for the late reply… and yes, its correct.. +/- abit of the measurements is fine.